The tablet's big screen means editing Word documents will cost you. Microsoft surprised the tech world two weeks ago when one of its executives appeared on Apple's stage to demonstrate new features for the company's Office apps on the new iPad Pro. While that moment in the spotlight showed off Microsoft's commitment to Apple's platform, there's an important catch that wasn't mentioned on stage. As it turns out, iPad Pro users will have to pay for an Office 365 subscription if they want to edit documents on Apple's new tablet. That's a big difference than the current state of affairs on iOS. Right now, all the devices running Apple's mobile operating system that are currently available can be used to view and edit documents for free through Microsoft's productivity software. What sets the iPad Pro apart from its counterparts in Microsoft's eyes is the massive 12.9-inch display. 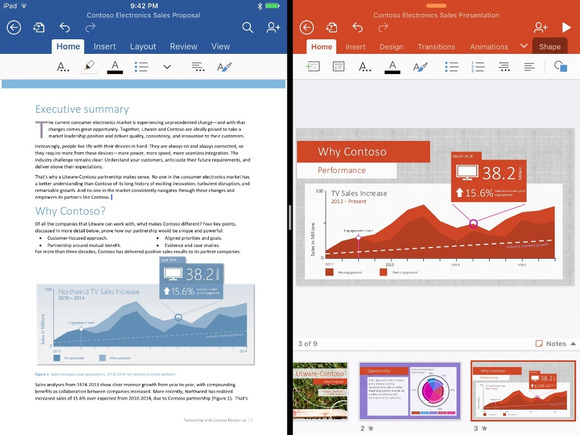 Microsoft allows users with devices that have screens smaller than 10.1 inches to edit documents for free, but users of devices larger than that have to pony up for an Office 365 subscription. It's not just iOS: the same policy goes for Android and Windows tablets as well. The restriction does make a certain amount of sense, since the iPad Pro's screen is larger than the display on some laptops, like Apple's MacBook. The iPad Pro might be able to replace a computer for some people, which means that giving away Office for free could hurt Microsoft's revenue. In a blog post announcing the plan to offer editing features for free on mobile devices, Microsoft Corporate Vice President Kirk Koenigsbauer said that the company is using screen size to separate personal and professional use of its apps. Requiring an Office 365 subscription may turn some consumers off from using Office on their iPad Pro, but it likely won't affect Microsoft's business of selling its productivity software to businesses. Companies that want to give iPad Pros to their employees may be on Office 365 already, and if they aren't, Microsoft's policy could be the added push it needs to get a subscription that will cover employees' computers, tablets and phones.